Tristan's 2017 Remembrance Sunday service was held on the 12th November 2017 at St Joseph's Catholic Church. There was a very good attendance even though the men were busy with the unloading of the MV Baltic Trader. 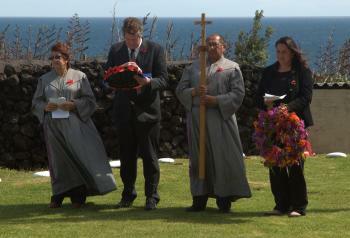 Wreaths were laid by the Administrator Sean Burns and Deputy Chief Islander Emma Swain. 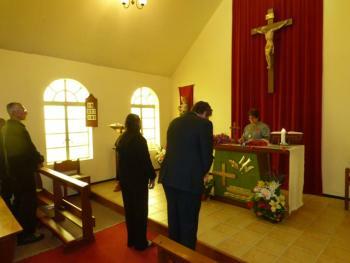 The service was taken by Eucharistic Ministers Anne Green and Dereck Rogers. 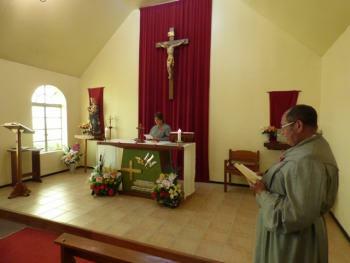 Anne Green and Dereck Rogers conduct the service. Emma Swain and Sean Burns receive the wreaths. 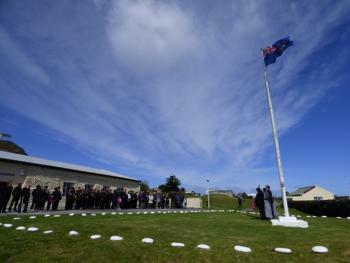 The procession led by Dereck Rogers leaves the church to lay wreaths and conclude the service at the flagpole. The wreath laying party. 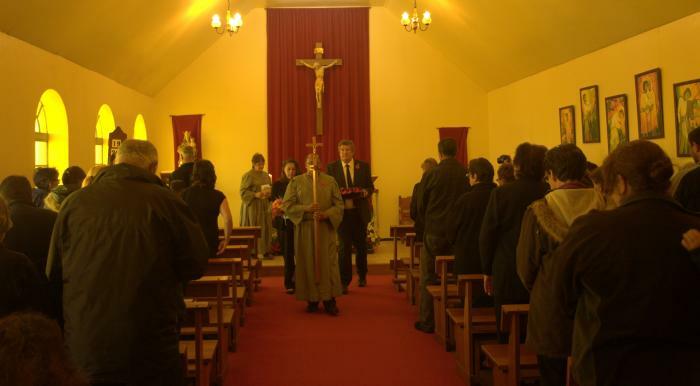 From left: Eucharistic Minister Anne Green, Administrator Sean Burns, Eucharistic Minister Dereck Rogers, and Deputy Chief Islander Emma Swain. 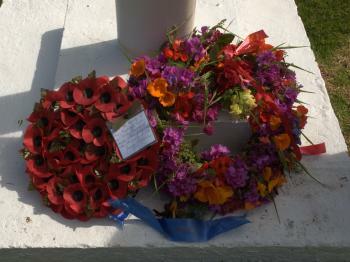 The dedication reads: "Lain on behalf of Her Majesty's Govt., in remembrance of those who died in defence of the South Atlantic." The island wreath was made by Doreen Swain. The congregation assembled at the flagpole in front of Prince Philip Hall. 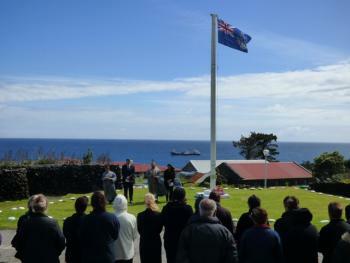 Concluding Remembrance Sunday at the flagpole, with MV Baltic Trader offshore in the background.